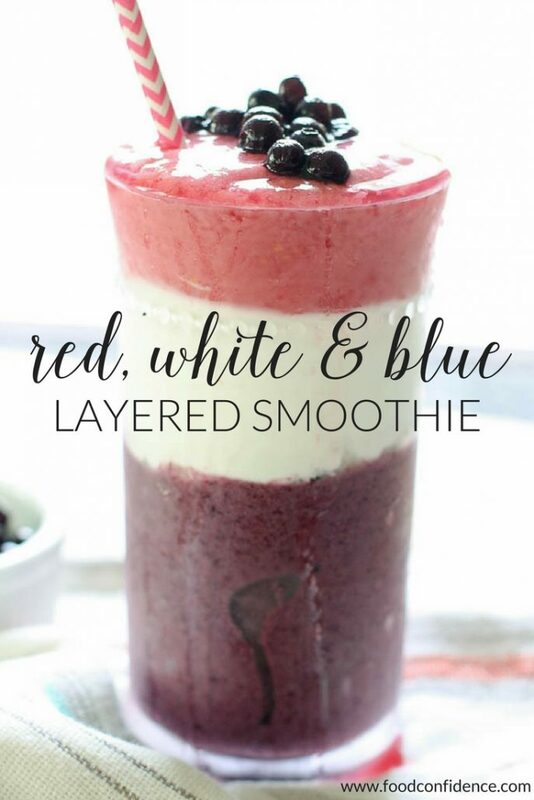 I’ve got a fun and festive recipe for you today, courtesy of my friends over at Wild Blueberries – a Red White and Blue Layered Smoothie! I love any holiday that gives me an excuse to make fun food, and the Fourth of July is no different. Come to my house for a July 4th celebration and you’ll probably be eating nothing but red, white, and blue food. Rather than relying on food coloring to make everything festive, I prefer to stick to the colors mother nature gave us! If you’ve ever tried to create blue food naturally, you probably know you don’t have many options. But Wild Blueberries are as close as you get to a bright blue color, no food coloring required! This beautiful hue is due to anthocyanins, the phytochemicals that give Wild Blueberries their deep purple-blue color and are responsible for many of their antioxidant benefits. 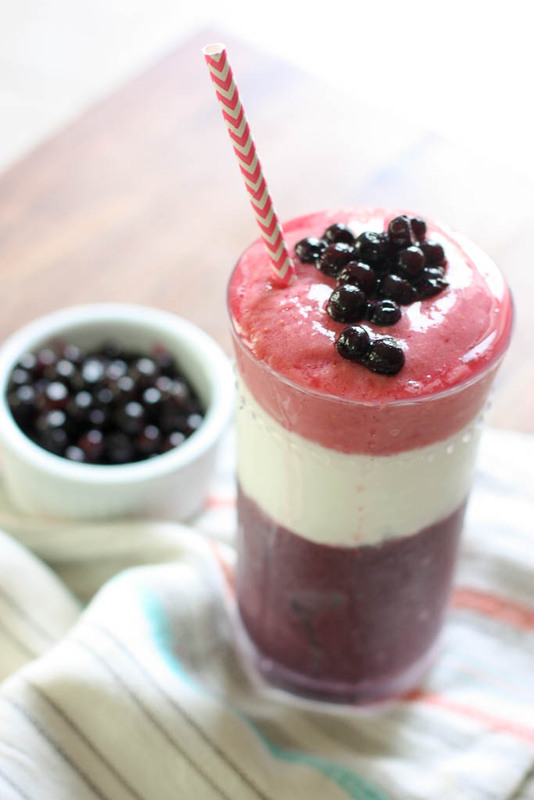 Wild Blueberries are the perfect addition to this fun layered smoothie, not only because of their color, but also because they’re duper delicious! You know I love a good Wild Blueberry smoothie (or chia fresca), and this one is triple the fun. The blue layer is a yummy blueberry-banana-peanut butter smoothie, the white layer is a super creamy layer with bananas and coconut whipped topping, and the red layer is light and fruity with raspberries and cherries. 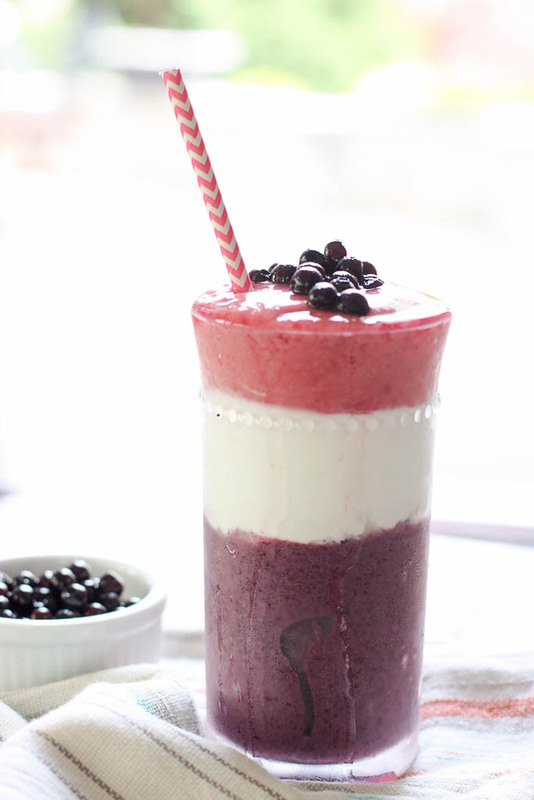 All together you’ve got a gorgeous festive smoothie that you can feel good about serving your guests! 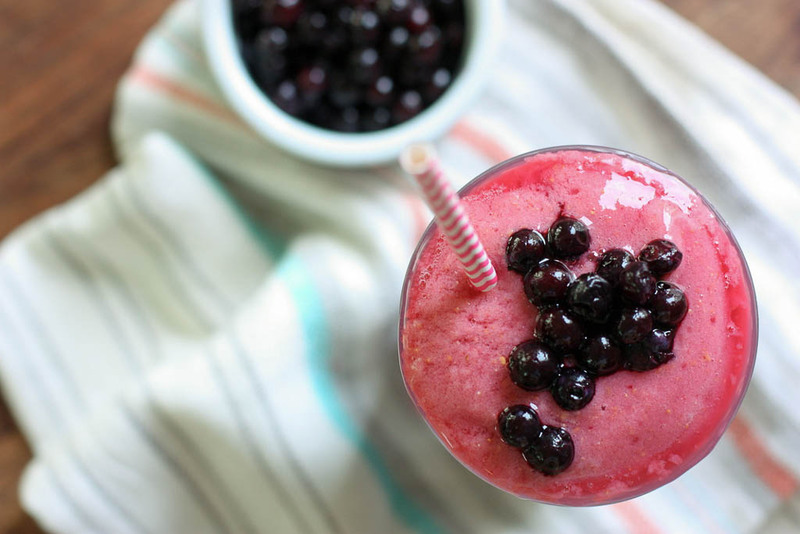 This smoothie is super refreshing, which makes it perfect for serving on July 4th or any other hot summer day. The key to getting beautiful layers is freezing the glasses for a few minutes between layers. That lets each layer firm up a bit before another layer gets poured on top. No need to freeze overnight or anything, just for a few minutes while you wash out the blender and prepare the next layer! The layers look super impressive, but are actually really easy to make – you know I’m all about simple recipes! This summer, stay cool and go WILD with Wild Blueberries. From July 5th – 26th, the folks over at Wild Blueberries is hosting its Wild Blue Summer Sweepstakes and giving away six NutriBullet PROs – the official blender of Wild Blueberries. These high powered blenders are perfect for making delicious smoothies that help us all keep cool all summer long! To enter simply visit this link from July 5th – July 26th and enter your email address. As a “Thank You,” the folks over at Wild Blueberries have created a Wild Blue Summer Recipe eBook for entering. This recipe book features eight recipes (including a few of my own!) to help you stay cool and healthy this summer! Visit the Wild Blue Summer Contest page to learn more and enter! Clean out blender and prepare third layer. Remove glass from freezer and pour in final layer. Top with more Wild Blueberries. This is a spectacular smoothie. I loved seeing your SA pics. Honeymooned there. Great memories to relive! Can’t wait to see the “real” camera shots.